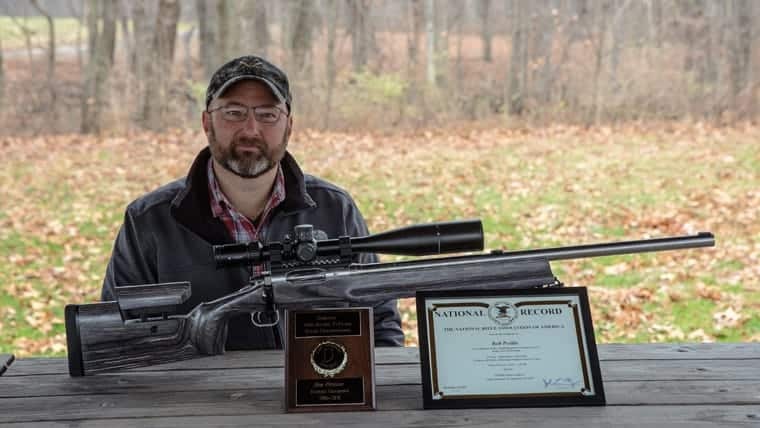 Less than one year after participating in his first F-Class match, Bob Petillo set an F-Class National Record in the Police category with his Criterion pre-fit rifle build. Currently using a 28” Bull contour barrel chambered in 6.5×284 Norma, Bob is currently using a handload recipe featuring Berger 140gr. Hybrid Match bullets seated to a COAL of 3.160” with about .050 jump. He is currently seeing velocities of 2,950 FPS with 48.4 grains of H4350 with Lapua brass and CCI BR2 primers. Bob began competing in F-TR in April of 2017 with a Remington 700 before upgrading one of his Savage rifles with a Bull contour 6.5×284 Norma pre-fit purchased through Northland Shooters Supply. This barrel swap resulted in a reduction in group size into the neighborhood of .2 MOA, and opened his eyes to the ease in which pre-fit barrels can be installed. By July of that same year Bob had once again upgraded his F-Class rifle, this time purchasing a Bighorn action, Jewell BR trigger, a Vortex Golden Eagle, and a Bobby Hart stock that he had bedded himself. In July he won Expert Class in the Indiana State Mid-Range championship, and by September he had set national records in the 800, 900, and 1,000-yard Fullbore Police category. Although his 900 and 1,000-yard scores had been topped by October, his 800-yard record (150-9x) still stands. The ease of installation and performance potential offered by these pre-fit barrels is what has most impressed Bob with his recent rifle build. As per the Criterion Barrels Inc. National Record policy we will be awarding Bob a complimentary pre-fit barrel design of his choosing. We wish him the best of luck in the 2018 competitive shooting season and look forward to seeing how his new barrel winds up performing. If you know of any shooters who have set national records with Criterion barrels, please have them contact us over the phone at (262) 628-8749 or via email at josh@criterionbarrels.com. We have a free barrel standing by with their name on it! This entry was posted in Articles, National Records, Reviews, Shooter Testimonials and tagged 6.5x284 Norma, Bighorn Arms, Bob Petillo, criterion barrels, Criterion Record, f-class, National Record, Pre-Fit Barrel National Record. Chrome Lining vs. Salt Bath Nitriding: Which Barrel Finish Is Better? What Kind of Practical Accuracy Can You Expect From A Criterion Pre-Fit Barrel? Handloading Makes a Difference!